Objective: Laparoscopic splenectomy (LS) has been adopted as the standard technique for splenectomy in patients with immune thrombocytopenia (ITP). However, the safe level of platelet count (PC) and the necessity for platelet transfusion during LS still remain controversial. 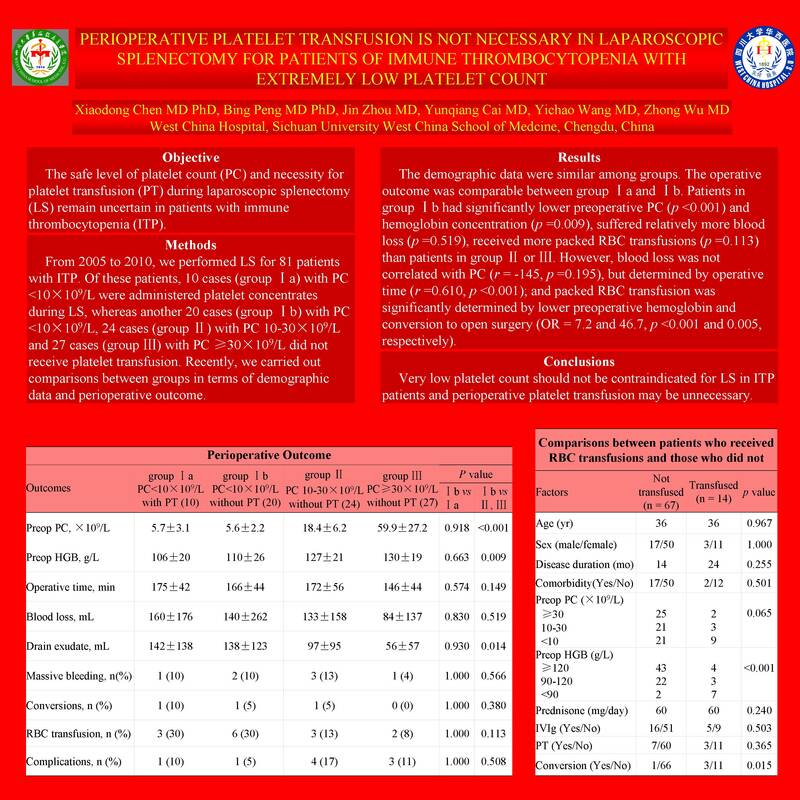 This study was aim at evaluating the feasibility, safety and efficacy of LS for ITP patients who had extremely low platelet count (<10×109/L) without perioperative platelet transfusion. Methods: From 2005 to 2010, 69 patients with ITP underwent LS in our department. Of these patients, six cases (group Ia) with PC <10×109/L were administered platelet transfusion during LS, whereas another 16 cases (group Ib) of this condition, together with 22 cases (group II) with PC =10-30×109/L and 25 cases (group III) with PC >30×109/L, received no platelet transfusion. Recently, we carried out comparisons between groups in terms of demographic data and perioperative outcome. Comparisons of dichotomous variables were carried out using Fisher’s exact tests; continuous variables were evaluated using one-way ANOVA analysis. The correlation between platelet count, operative time and blood loss was tested by means of bivariate correlations. Logistic regression model was used to determine the best predictive variables for RBC transfusions. Statistical analysis was performed using the SPSS for Windows, version 16.0. Results: LS was completed in 67 patients. Five patients (7.2%) experienced massive bleeding (>400ml) during surgery mainly from splenic capsular tears or venous branches near the hilum, of whom two patients (2.9%) needed conversion to open surgery. No postoperative bleeding was observed. Ten complications occurred in eight patients (11.6%).The operative time, conversion and complication rates were similar among groups. In general, patients with PC <10×109/L had a significantly lower preoperative hemoglobin concentration (p =0.035), suffered relatively more intraoperative blood loss (p =0.612) and postoperative drainage exudate (p =0.061), received more packed RBC transfusions (p =0.068) than patients with PC =10-30 or >30 ×109/L. However, blood loss was not correlated with the level of PC (p =0.116), but determined by operative time (r =0.636, p <0.001); and RBC transfusion was significantly predetermined by lower preoperative hemoglobin (OR =23, p <0.001). Conclusions: ITP patients with PC <10×109/L could be splenectomized safely and successfully without platelet transfusion. Therefore, we recommended that perioperative platelet transfusion might be not necessary in LS for patients of this condition.